At Genesis Dental, we pride ourselves on providing a wide range of dental treatments to cater to the whole family. Our team creates a friendly atmosphere at our practice and we can assure you that you’re in capable hands when visiting us. You can contact us to make a booking for something as simple a cleaning or as complex as dentures. Dentures are a plate or frame that is interested into mouth, which houses one or more artificial teeth – making it the perfect solution if you have irreparable damage to your teeth or missing teeth. There are various types of dentures available depending on what you require. Full sets of dentures are made with a synthetic base that fits on your gums, giving you a natural smile. Sometimes known as a dental implants, a permanent denture is a frame containing the artificial teeth, which is fixed. If you currently have removeable dentures, you can chat to us about opting for the permanent option, and you can say goodbye to denture adhesive pastes or strips! 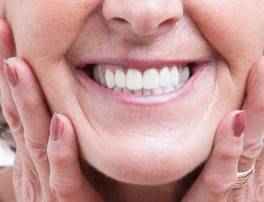 Partial Dentures If you only have one or a few teeth missing, partial dentures are a great option. We firmly believe that no one should meddle with healthy teeth – so don’t think you’re at a loss! We can create a partial denture for even just one tooth, that fits into your mouth perfectly. We understand that dentures take a lot of strain – fixed or removeable. Whether you’ve fallen and damaged your dentures, or taken a knock to the mouth playing sports, we can assist you with a comprehensive denture repair solution. Speaking of denture repairs, it is necessary for you to treat your dentures delicately, as even a drop on the floor could cause them to break. When you’re not wearing your dentures, place them in a glass of cold water or a denture soaking solution. This will ensure that they remain hydrated and clean. You need to brush your dentures just like you would brush your teeth! While there are cleaning solvents available that you can soak them in, nothing beats a thorough brushing that will undoubtedly remove food particles and plaque. Whether you have a full set or partial dentures, you’ll still need to brush your palate, tongue, and gums every day (use a soft-bristled brush). Maintaining a regular brushing routine will help keep your mouth hygienically clean and healthy. For more information about dentures, or if you’d like to make a booking for a denture consultation, please contact us today.